Flexible options and discounts are available for our academic customers. Other formats and bundles are available to ensure you get the best value access to the information you need. Online users can also choose to add the British Approved Names (BAN) 2017 & Supplement No.2 to their package, gaining easy access to this useful reference source of medicinal substance names. 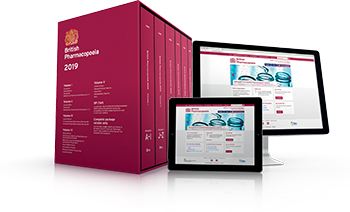 These licences give simultaneous access online to the full text of the BP 2019 edition and can be used on workstations, laptops and other portable devices.